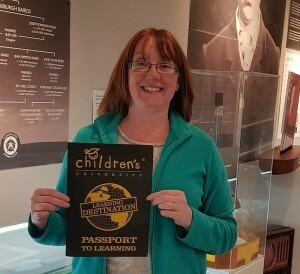 The recently opened Helensburgh Heroes Centre on Sinclair Street, has become the area’s first designated Children’s University Scotland Learning Destination. Children’s University Scotland seeks to provide children aged 5-14 with the opportunity to take part in exciting, interactive and voluntary learning activities outside of normal school hours. Young visitors to the Heroes Centre will be able to learn about the many inspirational men and women with connections to the area through the permanent exhibition space and will then be invited to nominate their own personal ‘hero’, describing their qualities and what’s makes them special. Children sign up to Children’s University through their school to receive a Passport to Learning and a login to the Aspire website. Children use Aspire to find out about exciting activities available in school, at home or in the community. When they take part, children record their activities in their Passport and on Aspire, unlocking credits and skills points that incentivise learning and celebrate achievement. Credits lead to Children’s University certificates, presented at special graduations held in school, at community venues or at local colleges or universities. The charity believe that every child should have access to high quality learning beyond the classroom. Argyll and Bute Council’s Policy Lead for Education, Councillor Yvonne McNeilly said: “We want to promote as many learning opportunities as possible for our children. “The National Curriculum of Excellence encourages achievement, not just attainment, and by getting more children involved with clubs and organisations after school and at weekends, it makes them more aware of what opportunities there are and instills a sense of pride and independence.